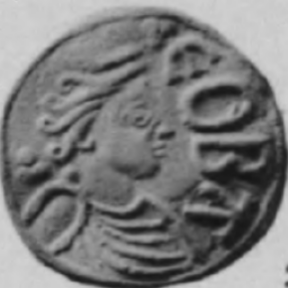 Cynethryth was queen consort to the Anglo-Saxon King Offa of Mercia. There is very little in recorded history about her but from what evidence we have, she was highly influential in the administration of her husband’s kingdom and like many royal mothers, she worked diligently to further the interests of her children. Cynethryth and Offa were the ultimate power couple in eighth century England. The birthdate and birthplace of Cynethryth is unknown. One line of thinking on her origins is based on the etymology of her name. 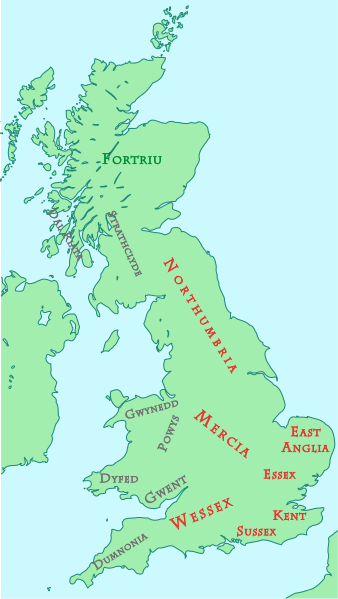 “Cynethryth” could be associated with the names of the wives and daughters (Cyneswith, Cyneburh and Cynewise) of King Penda of Mercia who reigned from c. 632 to 655 AD. It is possible she therefore may be one of his descendants and Anglo-Saxon. A chronicler who was writing her story in the thirteenth century presumes she was of Frankish origin. But all of this is speculative. Offa was a very ambitious king. His reign started in 757 and he began an intense power struggle to overtake the kingdoms surrounding Mercia. His predecessor, King Aethelbald, in 745-6, was roundly criticized by St. Boniface and other bishops for his many sins such as stealing church revenue, violating church privileges, imposing forced labor on the clergy and fornicating with nuns. Offa was determined to have more decorum in his kingdom and demonstrate more Christian values. He saw himself as an equal to his counterpart King Charlemagne across the sea in France. Offa wanted to guarantee the future of his dynasty and designated Cynethryth as his queen and raised her in importance in the kingdom. He endorsed ecclesiastical legislation that restricted the royal succession to the children of a legitimate wife, meaning one who was married in the Christian church. He was most likely faithful to Cynethryth to avoid the taint of bastardy on his children. Cynethryth’s name first appears in her husband’s charters after the birth of her son Ecgfrith c. 770. She was a frequent witness to the charters and appears as “queen of the Mercians” in some of them. Most significantly, there were coins struck in her name. 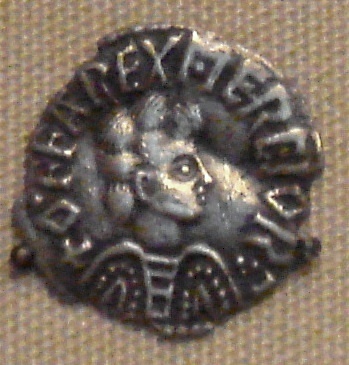 She is one of the few women to have coins issued in her name in the early medieval west. All of this political and ecclesiastical maneuvering by the couple was done to position themselves above their rivals. Cynethryth must have had a noticeable and prominent place in Offa’s court. There was a cleric, Alcuin of York, who was an English scholar, ecclesiastic, poet and teacher. In a letter Alcuin wrote during Offa’s reign, he hints that Cynethryth was too busy with the king’s business to read correspondence. In another letter he designates her as ‘mistress of the royal household’ and calls her pious. Alcuin emphasizes the legitimacy of her marriage with Offa and the legitimacy of her children and their suitability to inherit the throne of Mercia. The records indicate that Cynethryth gave birth to one son and at least four daughters. Her daughter Aethelburh became an abbess. Eadburh would marry Beorhtric of Wessex and earn a reputation for being an evil queen. Her daughter Aelfflaed was married to King Aethelred I of Northumbria and there was a fourth daughter named Aethelswith. In the legend of the killing of King Aethelbert of East Anglia, a daughter Aelfthryth or Alfrida appears but there is no clear evidence she existed. In the eighth century England, the crowning of the king’s heir was not a common practice. Crowning was customary in the Byzantine Empire to ensure a smooth succession and Carolingian monarchs had their heirs anointed by the pope starting in the 750’s. In 787, in an effort to ensure his dynasty would continue Offa decided to follow these continental practices and had his son Ecgfrith crowned and anointed as his co-ruler. Bishop Hygeberht of the newly established archdiocese of Lichfield probably performed the ceremony. Cynethryth may have urged Offa to have her son crowned. Cynethryth wanted to marry Ecgfrith to Charlemagne’s daughter c. 789. She also wanted to marry one of her daughters to Charlemagne’s legitimate son and presumed heir. Neither marriage materialized. Charlemagne didn’t consider the Mercian dynasty to be of sufficient quality to marry into his family. There is a terse entry in the Anglo-Saxon Chronicle which tells us that Aethelbert, King of East Anglia, was murdered during a visit to Sutton Walls, Herefordshire on the orders of King Offa in 794. But in another account of the murder written in either the late twelfth century or mid-thirteenth century in the literary history called “The Lives of the Two Offas”, Cynethryth is blamed for the crime. The writer was a cleric of the monastery of St. Albans which had been founded by Offa. In this account, Cynethryth is the evil councilor of the king and poisons his mind against King Aethelbert who was a suitor to their daughter. Offa refused to murder Aethelbert so Cynethryth did the deed herself. The story goes that when he visited, she had a pit dug in the bedchamber and perched a chair above it. Aethelbert was lured into the chamber by the promise of viewing his future bride. When he sat in the chair he fell into the pit and the queen’s servants suffocated him with cushions and hangings. Another version of this story has Aethelbert beheaded. The motive for the murder is not given. The reasons why Aethelbert became a sainted martyr and the subject of a cult are unclear. Whoever blamed Cynethryth was probably trying to deflect the blame from Offa who was the founder of the monastery where the history was written. Offa died of natural causes in July of 796. Ecgfrith did succeed him but died just a few months later, most likely of natural causes. Despite all of Offa’s conspicuous efforts to perpetuate his family’s legacy, the death of his son ended his dynasty. There is evidence that Offa and Cynethryth owned extensive interests in numerous monastic houses. Pope Hadrian (Adrian) I named Offa and Cynethryth together in a privilege as having these interests. After Offa died, Cynethryth retired and took charge as Abbess of Cookham in Berkshire and she retained control of the church at Bedford where Offa was buried. There is evidence she was alive in 798 when a dispute over church land with Aethelhard, Archbishop of Canterbury was settled at a synod that year. She then disappears from the record. Even though Cynethryth was in retirement in a monastery and had lost her power, she probably never lost her dignity. Extremely interesting. I enjoy it very much.